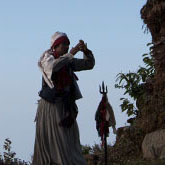 Another project which I am currently working on is concerned with a topic I have been studying for the last ten years: The Dumi Rai of Eastern Nepal and their shamanistic rituals. In my project titled ‘Ritual and Space: Identity based on Ritual Landscape among the Rai of Eastern Nepal’, the main research question is concerned with ritual landscapes and territories as perceived by the Rai communities. In what ways are they defined as a sacred topography in myth and ritual? And how are they used by local agents in power struggles and in the formation of contemporary identities? To answer these question, I’m documenting Dumi ritual recitations and practices and their symbolism as major source and starting point. The project is affiliated with the Center for Nepal and Asian Studies (CNAS) of Tribhuvan University Kathmandu. The project is integrated into the project ‘Ritual, Space, Mimesis: Performative Traditions and Ethnic Identity among the Rai of eastern Nepal’, lead by Prof. Dr. Martin Gaenszle at the Institute of South Asian, Tibetan, and Buddhist Studies (ISTB) of the University of Vienna. It is conducted as a sub-project alongside the project ‘Ritual and Mimesis: Identity based on Dance‘, led by Marion Wettstein, and funded by the Fonds für Wissenschaftliche Forschung (FWF), Austria. My dissertation thesis in Visual Anthropology that I successfully defeated in September 2011 is currently being prepared for publication. 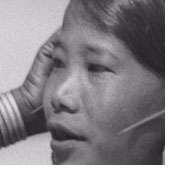 The thesis is concerned with historical photographs of the Nagas and is based on two photographic collections, assembled by the anthropologists Christoph von Fürer-Haimendorf and Hans-Eberhard Kauffmann who both travelled among the Nagas during the 1930’s. It focuses on Kauffmann’s work which was largely unknown until I discovered the original photographic films in an German archive. His photography is explained and contextualized through the work of Fürer-Haimendorf. A ‘pictorial history’ of the Naga introduces earlier image sources and shows how they changed and developed until today. For further projects, please visit the CV section of the website and click on the “more information…” links underneath the project descriptions.